When one thinks of Depression Glass what automatically comes to mind is the pink, green, yellow, and crystal [that’s DG lingo for clear] that was made in the 30s and 40s by the American mega-glass companies Federal, Hocking, Hazel-Atlas, Jeannette, MacBeth-Evans, amongst others. Often overlooked, because of these Goliaths of glass, is our own home-grown Depression Glass. While our relatively David-size companies did not compete in the U.S. market much at all, they did supply thousands and thousands of Canadian households with attractive, reasonably priced glassware. There have been no fewer than forty-three glassworks spread throughout Canadian towns and cities from 1839 to the present. The earliest effort was the fabled, short-lived Mallorytown Glass Works established in Mallorytown, in eastern Ontario. Amongst the larger glass concerns producing pressed glass around the turn of the century were the Burlington Glass Company, Nova Scotia Glass Company, Jefferson Glass Company, and the Dominion Glass Company. By 1913, Dominion Glass had taken over the other three firms. Dominion at one point had factories in Redcliff (Alberta), Burnaby (British Columbia), Winnipeg (Manitoba), Bramalea, Hamilton, and Wallaceburg (Ontario), and Montreal (Quebec). Through the 1920s and 30s Dominion churned out an amazing range of glass items that turned up in many a household: rolling pins, wash boards, bottles, tableware, lamps, doorknobs, percolator tops, fish bowls, and candy containers. In all Dominion created some 5,000 moulds for a diverse range of glass items. 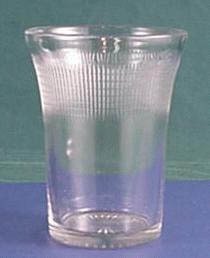 What most interests Depression Glass collectors are glass tablewares. Through the 30s and 40s there were two manufacturers of glass plates, bowls, tumblers, and other tablewares in Canada: the afore-mentioned Dominion Glass Company and Pyrex Canada, the MacBeth-Evans division of the U.S. Corning Glass Works. 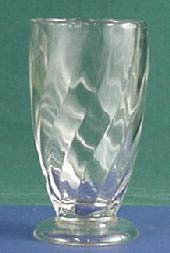 The Dominion Glass Company primarily produced crystal [clear] glass items for the table in several main patterns: Hiawatha, Saguenay, Swirl, and Stippled Swirl. Saguenay was also produced in a number of cheerful fired-on colours: light green, yellow, pink and light blue. Besides the usual crystal Swirl is also sometimes seen in a frosted treatment (treated with camphoric acid); also occasionally seen are fired-on colours of red, green, yellow, blue or grey; and in a clear cobalt colour in the creamer and sugar (thought to be experimental). Unlike our American cousins whose DG has been widely written about over the past twenty-five years, our Canadian Depression Glass coverage has been sparse. Thanks to this relative lack of information widely available about Canadian Depression Glass, one can still with some hunting find various items for a very reasonable sum. One keen Ontario collector reported to me that she found a nice little grouping of Canadian Saguenay and Swirl at a local garage sale last month. A lucky Manitoba collector this month was able to brag about latching on to fourteen pieces of Piecrust for only a couple of dollars! Canadian Swirl cobalt sugar (rare) While the Canadian Depression Glass Shows* remain the best source for this glass, antiques malls, shows, and flea markets are still good hunting grounds. 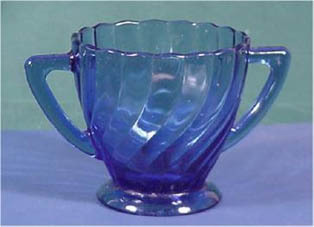 One can set a lovely table of Canadian Depression Glass by using the simpler crystal wares, the colourful fired-on patterns or the sharp blues of Piecrust or Crown. By collecting and enjoying Canadian Depression Glass we can take pride in maintaining a little bit of our Canadian heritage. (Late 1930s through the 1940s) -- clear only. The pattern consists of a series of squared-off diamond shapes. Much like the American Homespun pattern, the Saguenay pattern consists of a series of thin ribs. (Late 1930's through the 1940's). 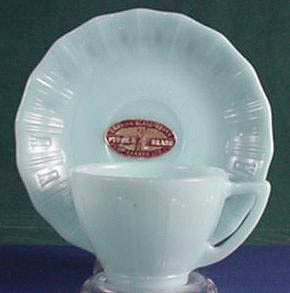 Swirl is thought to have been developed from a cereal bowl that was a premium for a pre-WWII breakfast cereal. Cup & saucer, 9 oz. Sugar with lid, footed, 10 oz. Stippled effect was introduced to cover mold wear. Also found with red, green, yellow and blue fired-on finishes. Cobalt blue is found only in the creamer and sugar. The glass tablewares produced by Pyrex Canada, a division of MacBeth-Evans division of Corning Glass Works are rather different. 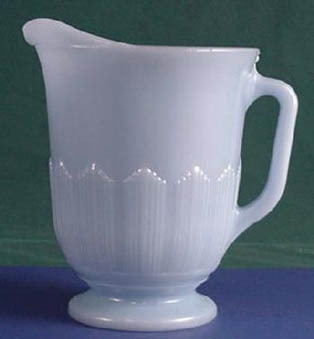 Pyrex produced opaque glassware in Canada in light blue, turquoise blue and in ivory. This company came into existence in 1945 and was the first to manufacture heat-resistant glassware in Canada. Delphite Blue marked “Made in Canada” and “PYREX” on the bottom. It was named for its distinctive fork-like marks that ring the borders of most pieces in this pattern. Production of Corex began in 1948 at the Corning Glassworks of Canada Limited at their plant in Leaside, Toronto. The pattern was formed from the same molds as the U.S. Cremax pattern. It is very similar to the Piecrust in design. All items are marked on the bottom "COREX TM REG MADE IN CANADA"
Pyrex, MacBeth-Evans Division of Corning Glass Works, (1940s.) -- a turquoise blue shade of glass -- similar edge as Piecrust, but has a series of three-pointed crowns around the border. Canadian Depression Glass Association, various Newsletter issues from 1976-99. Handler, Sandra. “Pie Crust Made in Canada”. August, 1975. Unitt, Peter and Anne Worrall. Unittís Canadian Price Guide to Antiques & Collectables, Book Fifteen. Markham, Ontario: Fitzhenry & Whiteside, 1993. Warner, Ian. Canadian Swirl. Glass Collectorís Digest, vol.I, no.1, June/July, 1987. Marietta, Ohio: The Glass Press, Inc.